Militants shelled positions of Ukrainian servicemen along the whole demarkation line in the Donbas 67 times during the last day, according to the ATO press center. Militants shelled the ATO forces' positions from small arms and grenade launchers in the vicinity of Maryinka 22 times. The situation near Krasnohorivka remains tense. The ATO forces' strongholds in Krymske, Piski, Novozvanovka, Talakovka, and Mayorsk were shelled from mortars. During the last day, February 12, 2016, two Ukrainian militaries were wounded in battle; nobody perished. The information was presented at a briefing by Colonel Andriy Lysenko, Presidential Administration spokesperson on ATO related issues. The work of checkpoint in Maryinka was suspended due to constant shelling by illegal armed groupings, as the Ukrainian National Security and Defense Council informs. During the last seven days 98 shellings were registered in the vicinity of this settlement. Earlier, on February 13, State Border Guard press service informed that in the morning there were 300 vehicles waiting for entering the Ukrainian territory and 350 to leave it. All in all, on February 12, 5480 people and 1235 vehicles crossed the demarcation line at Maryinka checkpoint. A ceremony devoted to honouring internationalist warriors and marking the 27th anniversary of withdrawing Soviet troops from Afghanistan was held in Kurakhove on February 13. The perished were commemorated with a moment's silence and laying flowers to the monument. At the same time there was an ongoing battle in neighbouring Maryinka which began at 9.30 a.m. It is reported that a serviceman was wounded in it. A rally devoted to 98th anniversary of Donetsk-Kryvy Rih Republic establishment (it existed for several months as a part of the Russian Soviet Federative Socialist Republic in 1918) took place near the monument to Artem in Donetsk on February 12. Contemporary “DPR” ideologists claim it was a forerunner of their statehood. Denis Pushylin, “head of “DPR” people's council” informed about his plans “to libarete the regions which are situated beyond the demarcation line”. Several houses were damaged and some caught fire as a result of mortar shelling in the settlement of Trudovsky. A piece of shell broke the windscreen of a bus #42 at the bus station. There were no passengers inside the bus. Militants claim there were no casualties but witnesses say some people were wounded. 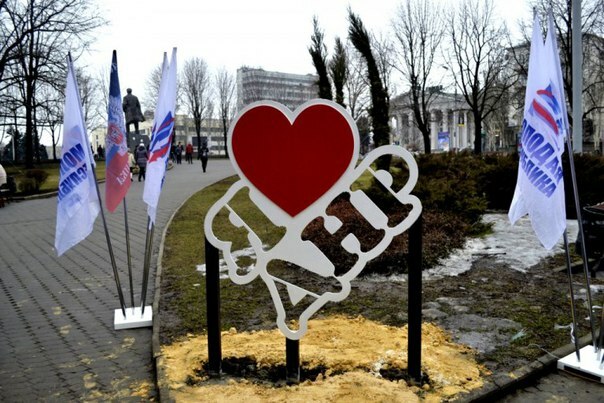 An “I love DPR” sign was unveiled on Lenin square in Donetsk on February 13. The ceremony was devoted to St.Valentine's day. At a rally devoted to commemoration of internationalist warriors Zakharchenko got one more medal “For bravery and courage” from veterans of Afghan war. It was also reported that an office of the “Russian Union of Afghan War Veterans” is to be opened in Donetsk.